This example illustrates the use of the LAG= option to indicate nonstandard precedence relationships between activities. 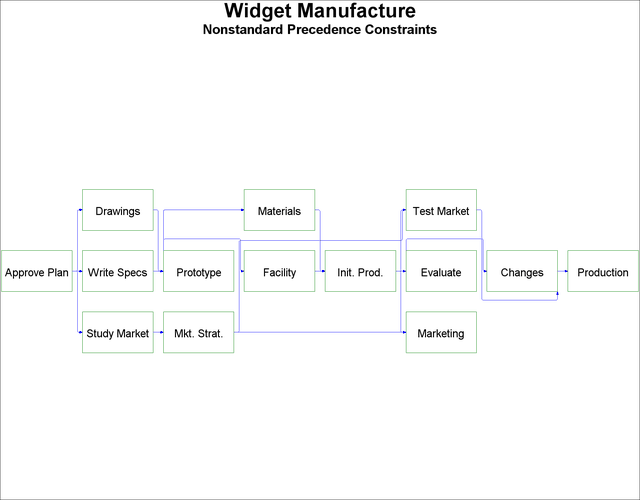 Consider the widget manufacturing project described in the earlier examples. Some of the precedence constraints between the activities may be nonstandard or have a nonzero lag value. For example, the activity 'Init. Prod.' may not be able to start until 2 days after the completion of the activity 'Facility.' The Network data set is displayed in Output 9.6.1. The variable lagdur indicates the type of relationship between the activities specified in the variables task and succ. The following statements invoke PROC NETDRAW with the LAG= option. The resulting network diagram is shown in Output 9.6.2. Study Market 5 Mkt. Strat.